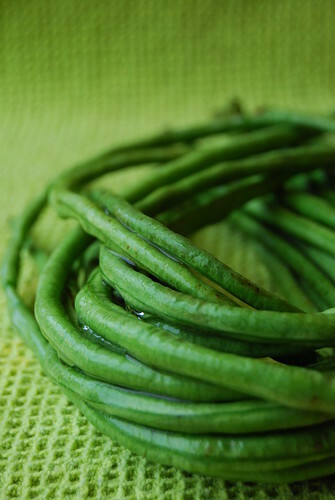 Sitaw, also known as long beans, or even more excitingly as snake beans (shiver-shiver), are a standard fixture in my organic veggie basket. It is a vegetable commonly found at the markets here. Pretty much most of us grew up eating it in one form or the other – and I can hazard a guess that the form most common was adobong sitaw. Adobo is arguably our National Dish, being cooked in a plethora of versions from one end of our archipelago to the other (and beyond!). Every cook has their own version and you can find my basic one here (although I must admit I have more versions besides!). We can turn any edible into adobo…from chicken to pork to beef to lamb (I love this!) to seafood to vegetables. 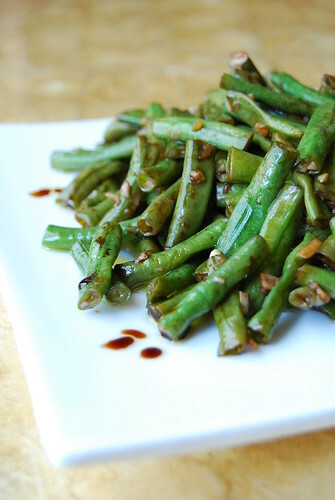 And adobong sitaw, long beans cooked with soy sauce and vinegar, is one of the most typical veggie-adobos around. Adobong sitatw is also one of C’s favourite vegetable dishes so that, along with it being a regular in our veggie-basket, is the reason that it is often present in our dining table. Although C can wolf this down all day any day, I need a little more variation. I decided to try this dish using balsamic vinegar after seeing a similar preparation in a magazine. It is simple to make and provides a nice, tasty alternate to a much-loved but too-oft-repeated dish! – Heat oil and garlic in a wok/kawali or skillet (this way the garlic will infuse the oil without burning). – Once the garlic’s aroma wafts up, and it starts to sizzle, add the sitaw/snake beans and toss so everything is coated in garlicky oil. Sautee until almost done. – Add balsamic vinegar and sautee until the vinegar’s acidic smell mellows, tossing once or twice to make sure all the beans are coated in the caramelizing vinegar. – Season generously with sea salt and freshly cracked black pepper. I love the sweet-sharp tang that the balsamic vinegar lends this dish, rounded out by the spicy-savouriness of the garlic. Paired simply with olive oil, sea salt, and lots of cracked black pepper, it is proof that you can get fantastic flavour using good ingredients without much fuss. The garlic-black pepper-vinegar blend is reminiscent of our adobong sitaw just enough for you to recognize a smidgen of comforting familiarity among bright new flavours. Tomorrow I am getting half a kilo of kalamansi with my basket, which I plan to turn into icy-cold, kalamansi juice…another way to combat the Manila summer heat! I created a blog (www.beeapproved.com) in which I explain to people what snake beans are. I stumbled across your photo and was wondering if I could use it in my blog because it is so great. Please let me know and if you refuse, I'll understand.